Young Concert Artists, which has been fostering the careers of gifted musicians since 1961, mostly presents the winners of its auditions in recitals, including a popular series in New York. But it has become a spring tradition for this essential organization to present a gala concert featuring select winners from recent years in concerto performances. Hearing young musicians in concertos reveals further dimensions of their artistry. So it was on Wednesday night at Alice Tully Hall for the 53rd Young Concert Artists Gala Concert, hosted by the organization’s founding director, Susan Wadsworth. With Carlos Miguel Prieto conducting the Orchestra of St. Luke’s, three impressive young musicians played concertos by Copland, Barber and Rachmaninoff. The Taiwanese-American violinist Paul Huang, a boyish-looking 23, gave a masterly account of Barber’s Violin Concerto. His warm, glowing sound and youthful energy were perfect for the opening movement of this justly popular work, in which a soaring melodic line flows atop the harmonically charged, restless orchestra. Yet, Mr. Huang was also alert to surprising melodic shifts and rhythmic twists in the violin part. There was nobility and wistful longing to the searching slow movement. 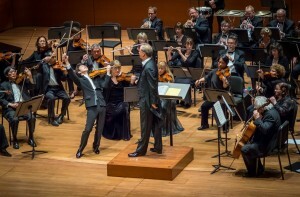 In the fiercely difficult perpetual-motion finale, Mr. Huang, supported by Mr. Prieto and the orchestra, reined in the breathless tempo just enough to bring clarity and bite to constant streams of notes in the violin part, which actually made the music seem more dangerous and exciting. Mr. Huang was given a rousing ovation.